I have worked as a NuStep Distribution Clerk for eleven years and have had the privelege of interacting with several customers. These are people from all walks of life, who have used the NuStep in rehab, and want to own one for their home. I have been told, more than once, by people who have experienced extreme physical challenges, that the NuStep has "saved their life". I don't make the products, I just ship them, but I feel humbled and blessed to be a part of a company that is making such a huge difference in people's lives. I love our T4r. Ended up in ICU because most of my hormones had been depleted. Definitely was not fun! Ended up in Rehab where I basically had to learn to walk again. It was there I discovered NuStep. Using it I was walking within that same week. Now having one at home I use it several times a day. To me it is well worth the cost! Thank you for such a terrific unit that's easy on my knees! NuStep is a life changing piece of equipment. Every detail is thought of so that these machines can accommodate pretty much everyone, no matter what injury, illness, or medical complication/diagnosis they are dealing with. I love working at NuStep because this company goes above and beyond for its customers and it's employees. At NuStep the goal is to transform the lives of those who purchase and use our products. It's not just about selling a machine. It's about providing support, motivation, friendship, community outreach, science backed research and all the exercise tools people need to get healthy and maintain that lifestyle. From the minute we are born we begin to age. It's important to have businesses like NuStep where the focus is on helping individuals of all ages, go through life and all its stages, in a healthy and positive mental frame. 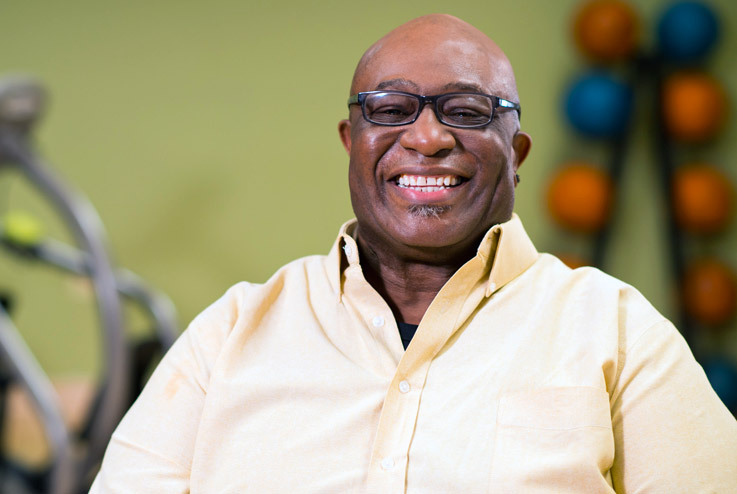 NuStep works to deliver the best inclusive equipment and truly has a global impact on health. The T4r is the only machine at the physiotherapy clinic that does not cause my ankle pain. Really enjoying getting active again for the first time in months, since my ankle injury. Great piece of equipment!!! My father-in-law recently purchased a new T4r system with the goal of exercising his way back to golf after a really bad sepsis infection almost killed him. About two weeks after receiving his new T4r system, and without ever being able to use it, my father-in-law passed away. We didn't know what to do with his expensive piece of equipment. Thinking that perhaps NuStep would have a suggestion, we called them. We were blown away by their response. "We'll take it back and give you a full refund, including all shipping costs." Say, what? Companies with this kind of customer service and understanding just don't exist anymore, right? What planet am I on? NuStep: you are amazing! You have renewed my faith in humanity and are the very definition of a decent, caring and moral business. Thank you!! I have had MS for about 20 years now, diagnosed first with RRMS and have progressed to the stage of SPMS. Physical therapy has always been a challenge for me, not so much in doing the therapy, but getting to the facility. Just getting to the PT facility was the PT itself. Also, as anyone with MS knows, one typically has a time during each day when your symptoms seem to be more manageable. For me that is the early evening. After years of struggling and ultimately giving up on getting to the facility (FT day job + family responsibilities), I decided to purchase the T5XR for in-home use. I love it. I can now do my exercise at a time that works for me (early evening). I have a long way to go, but I am up to 45 minutes at Level 4, about 2.25-2.50 miles. What a difference this machine has made in my life. Thank you so much. Outstanding piece of equipment, our son suffered a SCI in 2008. We purchased a NuStep for our home and his cardio is through the roof. 10,000 NuSteps throughout the day. This the best exercise machine ever, in 2014 I broke my back and it help me get back in shape . In 2018 I broke my ancle and is helping getting the strength on my ancle and legs, is so easy and fun to use it also helps by arms. Love, love this machine, unfortunately they do not have it in regular gyms. I am really thinking of getting one. Provides an excellent workout, whether you're looking for an intense cardio session or just wanting low-impact exercise; best quality I've seen in exercise equipment! We were introduced to the T4r while at our local YMCA. My husband is having a hard time with balance and walking safely. He has found that the NuStep trainer gives him the workout he likes without the worry of taking a fall (as has happened on the walking track). We will drive the distance several times a week just to make sure he can get the workout. Thanks NuStep! I have used these in rehab for several years. Only machine I ever enjoyed. Wasted a lot on a cheaper one that I hated. I got my excise down pat and .now I will not drive 30 minutes to excise. Got a tablet and can get internet so hope I am set. One of the most accessible pieces of workout equipment I have ever used! Such a great cardio workout. NuStep got me on my feet again after 4 spinal surgeries and a stroke. I do not think I would be walking today without the help...and now I will have one in my home to keep me going all year round! First heard of you when my PT put me on a T5XR last fall. I have never had such a positive experience exercising before! My rare condition that I was diagnosed with in 2013, makes mobility for me very difficult. Your machine gave me a level of comfort that I have not seen in a long time! For that, I say 'thank you!' I should really make it out to your facility sometime to personally say it. Also happen to be in Metro Detroit...an EMU '09 Alum here! Thanks again, and keep up the good work Should be writing to share my story soon! I used a NuStep in my in-patient rehab stay following my stroke in 2005. I really miss it’s extremely safe process for me to get some real exercise, without the fall risk of walking on a treadmill with my weak leg’s spasming ankle, and even more I miss the good stretch that it gave my contracting left arm. I am finally able to afford to get my own and will be ordering one for my home. I am very excited and can hardly wait, just have to wait until a room is prepared for it here, where my brother will also relocate my treadmill into, so that we will have a home fitness room for everyone in the house to utilize. I have had the pleasure of working for NuStep over 9 years now and it is such a Blessing working at a place where I sell a product that is so well Loved. It is such a privilege to hear our customers sing the praises of the benefits of NuStep all day long. And it is so rewarding to hear on a daily basis how we are truly Transforming Lives! NuStep is a great company to work for; I am fortunate to have a 10+ year professional relationship with the company. Their fitness equipment really does 'Transform Lives'! Live from NIRSA... my Nustep just told me I had a Great Workout!!!!!! Hi My NuStep Family and Friends. I would like to give an update on my recovery from my hip and joint replacement. Well it has been three weeks since I have been out of the hospital and the recovery is going well. But the doctors have forewarned me that this is not something I can rush or it could be worse. Like if I dislocate my hip at this point, I would have to have the surgery all over again and the recovery time is twice as long. So needless to say they didn’t have to tell me that twice. I still can’t drive for another couple of weeks, I can’t bend my knee or my right side more than 90° getting up or down for a couple more weeks, I can’t cross my legs and a few other things. The muscles has to get stronger and bond with new hip and joint. The best place I've ever worked and the best machine out there! This NuStep recumbent cross trainer made a huge difference for me while I was in a high quality, skilled nursing rehab facility, which I needed as part of my recovery following a serious accident, from being hit by a car turning the corner that threw me off my path while attempts to get across the crosswalk. The accident resulted in my having multiple fractures in my leg, pelvis, and ribs. After a week of starting intensive physical therapy, I was introduced to the NuStep, used it diligently practically every day from then on, even while I was in a brace and not ready to put weight on my leg & knee, which went for the ride, but still this enabled me to get healing from the motion, after nearly two months of use, on top of all the therapeutic efforts, I was walking again. I've left the facility and now looking for a fitness place in my area that has the NuStp. It was a life-savor for me, and miss it already. Love the nustep!!! It's helped me recover from total knee replacement. Am only 7 weeks out but hoping to purchase one for at home as I need to also lose weight. Thank you NuStep! I purchased my NuStep over a year ago & love it. I just had a bilateral PLIF with disk Interbody spacer & bone grafts Jan 13th. Within a few days of surg. I was taken to PT in hosp to try stairs. They had an older model NuStep & I told pt my doc told me I could use it. I started with 5 minutes in hosp. Came home Sat & have been using twice a day for up to 15 minutes. I got to 1 1/4 miles in 1 session yesterday 6 days after surgery. PT told me not to use arms at this time so I don't twist back. I already have signs surgery worked, pre surg. leg pain gone! My NuStep will be helping big time in my recovery. THANK YOU NuStep! The best ever! Best workout without any pain but lots of resistance and completely all over benefits. I'm obsessed with my NuStep and I love having one at my home for workouts while my kids are napping. Helps me stay in amazing shape and I never get bored with the boot camps I do around the machine. Love!!!! I made the 2 mile mark today in 25 minutes on 4 strength. I got up to 218 steps per minute at times one year ago I started at 77 steps per minute. For my community center for older adults, we have two NuSteps in our fitness room. Not only do new members join because we have the NuSteps (a lot of them have used them in rehabilitation settings and they are very comfortable in using them) but the current members love them. They are the most popular machines for our members - very easy to get on and off of, they feel safe on them, there is flexibility to use all extremities or just upper or lower ones, and they are getting a very good work out on them. People of all abilities can use these, including a lady that has very little use of her legs. The NuSteps are extremely well built and I never have any maintenance issues with them. I love that they are made in America, by a company that is so community oriented. All of the staff I have worked with over the years have been great! That includes the owners and the salespeople. We are going to be getting another one for another center to meet the demands of our SilverSneakers members. I have primary progressive multiple sclerosis and right arm and leg are very weak. Before being introduced to the NuStep at a rehab center, no other exercise equipment had worked for me. With the leg brace and the hand grip assist I was able to for the first time in years. I'm up to 60 minutes and 4700 steps on level 5. I love warming up at Northern Michigan Sports Medicine on the NuStep. First used this after my knee replacement therapy. Decided some time later that I needed to exercise at home so I picked a Nu Step T5XR. It sits by the TV which helps me going. Just finished my first mile in one sitting! Well worth the money! I'm so excited about our NuStep!! I love having the luxury at home. The team at NuStep is so supportive and like family!! I have 3 kids, an ill husband, and my own health issues. Being able to use my machine at my leisure is amazing! Include a photo of yourself? My introduction to the NuStep came after hip surgery in 2014. During physical therapy, the therapist put me on the NuStep T4r. I was impressed with the lack of pain and discomfort as compared to using a bike or treadmill and knew at that instant I would buy one of these machines. 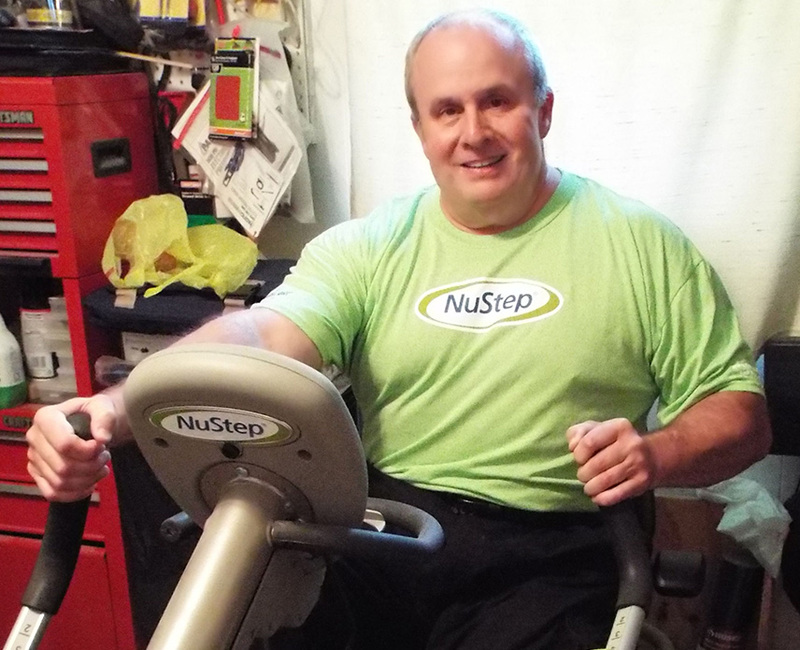 In 2015, after my physical therapy was over, I purchased a NuStep T4r. At the time, I weighed 291 pounds. Today, I’m 235 pounds and still losing weight. My goal weight is 200 pounds and I will easily meet or surpass that goal with the NuStep! As a Type 2 Diabetic, I’m maintaining my sugar levels and A-1C level perfectly. My cholesterol has dropped to normal numbers with exercise and medical management. 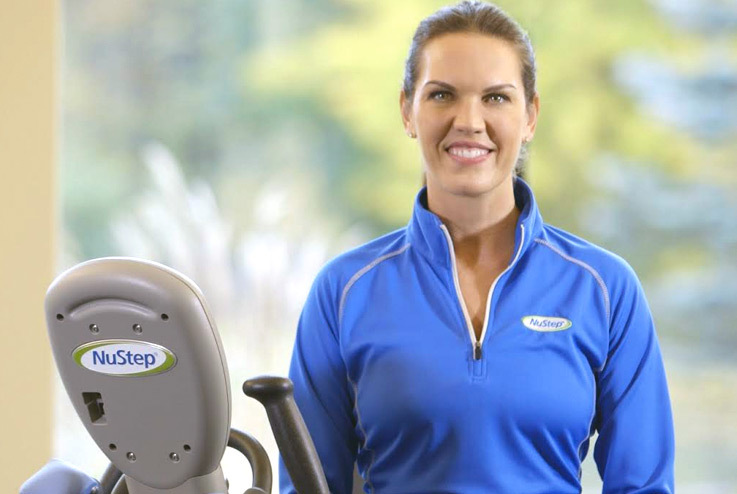 I exercise on the NuStep 30 minutes a day, 5 days a week and feel 100% better. This machine is the best I’ve ever used, and I’ll never be without one in my house. I think it is the best kept secret in the physical therapy and physical fitness industry. Time to Let the Secret Out! 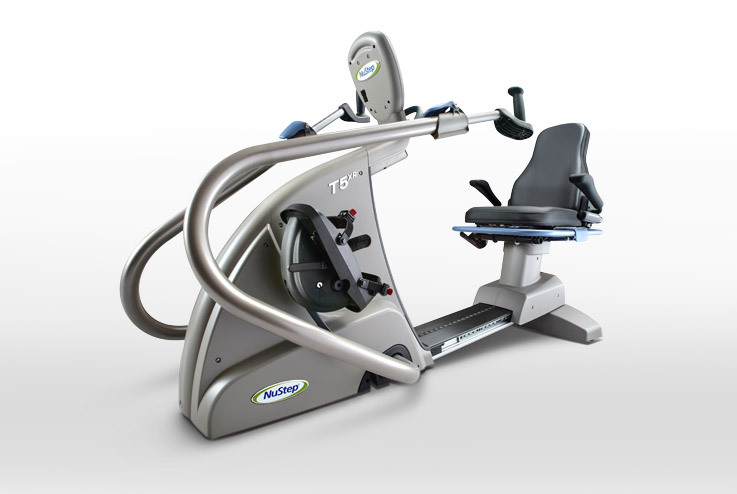 Our line of recumbent cross trainers are low impact and inclusive by design. Made in Ann Arbor, Michigan. These short videos will show how to maximize the benefit of each workout, and how best to exercise on the NuStep. Tell us how your life has been transformed by using the NuStep recumbent cross trainer. Individual results may vary. * If you are not totally satisfied with your NuStep cross trainer and accessories that you purchase from us, NuStep will accept a return of the cross trainer and accessories and will refund to you the full price that you paid, less NuStep’s costs in shipping and delivering the cross trainer and accessories to you. The only conditions to this guaranty are that you purchased the cross trainer and accessories directly from NuStep (not from a dealer) and they were delivered to you in the United States; that we receive a written notice from you asking for the return within the first 30 days after delivery to you; and that the cross trainer and accessories are in the same condition as when delivered to you when our shipping agent takes possession from you for reshipment to NuStep. We will pay the costs of re-shipment to NuStep.